Today's Wedding Wednesday post is unfortunately going to be postponed until next week. I'm going to close my eyes, sip this, and pretend I'm sitting on the beach in 80 degree weather. 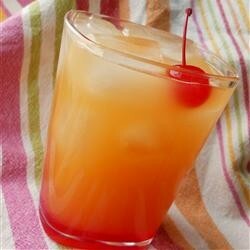 Quick and easy... 2 parts* pineapple juice, 1 part cake vodka, splash of Amaretto and splash of grenadine. Don't forget the cherry on top! *Part: "Part" means any amount you want. It could be 1 ounce, 1/2 ounce, 2 ounces, 1 cup or any other amount you want. It all depends on how big you want your drink to be. **Remember, please drink responsibly!